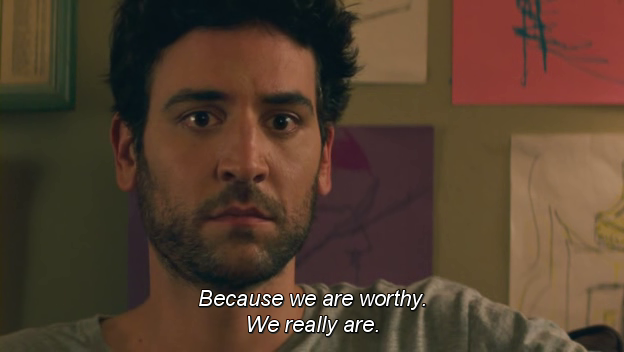 This is Josh Radnor's directorial debut but I preferred to watch Liberal Arts first because this movie has such low ratings in Rotten Tomatoes and Metacritic. I decided to give this a shot last night because I loved Liberal Arts so much, I felt like there must be something worth watching in this film. And as much as I love Zoe Kazan, her character in this movie was disposable. I feel a disconnect between her own story to the protagonist's story. It was as if her role was unnecessary. But I guess, a lot of people can relate to that type of struggle. 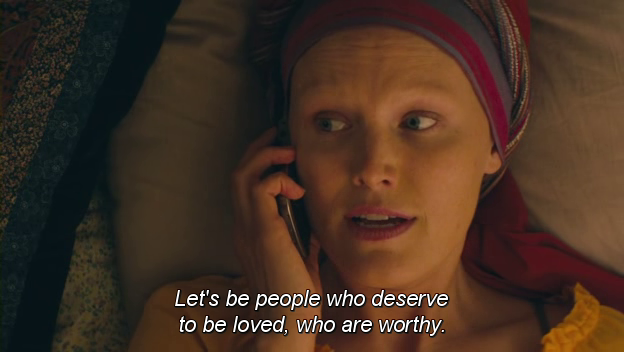 On the other hand, Sam's friendship with his alopecia-stricken bestfriend, Annie (played by Malin Akerman), was nice and very relatable from my perspective. Hahaha. Eventhough the movie felt like just a collection of ~*~lessons you'd learn while you're in your twenty-somethings~*~, it still had it's charm. It's funny and quite enjoyable. The scene where Kate Mara's character, Mississippi, tells Sam: "You write short stories, and I think you like living short stories. But I'm kind of ready for the novel, you know?" *rolls eyes* Cheesy, I know. But I liked it, what can I do? When Annie recounts the time when she was in a cab and the Indian driver told her to be continuously grateful. That besides saying, "Thank you," always follow it up with "More please." I think that was just so positive and I might start adapting that in my life. Might. Annie's second date with Sam #2. That scene was sooo good. The scene pictured above. A friend once told me that I'm the 'We accept the love we think we deserve' type of person when I can have so much more. I used to say that it's not that I choose to be that way but she believes otherwise. And now, I do believe her. Hahaha.